Do you know my first thought when the weather starts warming up toward summer? Weight loss! Honestly, I always put on a few extra pounds during the winter months so when spring arrives, I start thinking about ways to remove those extra pounds. What I found is that if I start off my day right, eating healthy and such, then I have a much more successful effort the rest of the day. So, I thought that I would look for some healthy breakfast recipes, some that are quick and easy to prepare since my mornings rarely run smoothly. 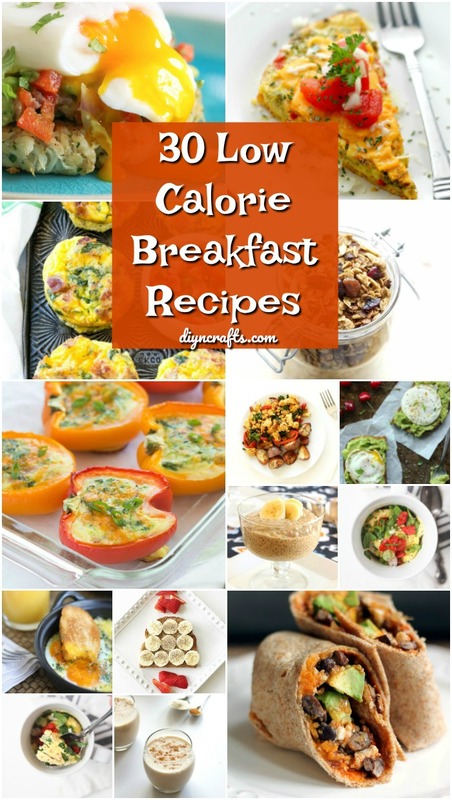 I found 30 low calorie breakfast recipes that will definitely help you to reach your weight loss goals. Even if you aren’t looking to lose weight, these recipes are all super healthy and just better for you than donuts and fast food. There are so many delicious dishes in here – from omelets to frittatas and even some oatmeal and muffin recipes. Whatever you like for breakfast, I have a low calories version that is going to really get you started on the right foot every morning. And, you should be sure to check out these 20 delicious detox waters that will help you to burn fat, too. I do love my breakfast in the morning and I’m not really a cereal type of girl. I prefer something with a little more meat on its bones, so to speak. So, many of these recipes have eggs, sausage and even bacon. There are also some great smoothies, some delicious muffins and so many other things that are going to make you glad to get out of bed in the morning. And, none of them have over 300 calories in a serving, so they are really low calorie and packed with protein! If you are looking to eat healthier this spring, these low calorie breakfast recipes will help you to do that. And, be sure that you take a look at these 40 refreshing popsicle recipes. They are also low in fat and calories! This tasty omelet is made in just two minutes. 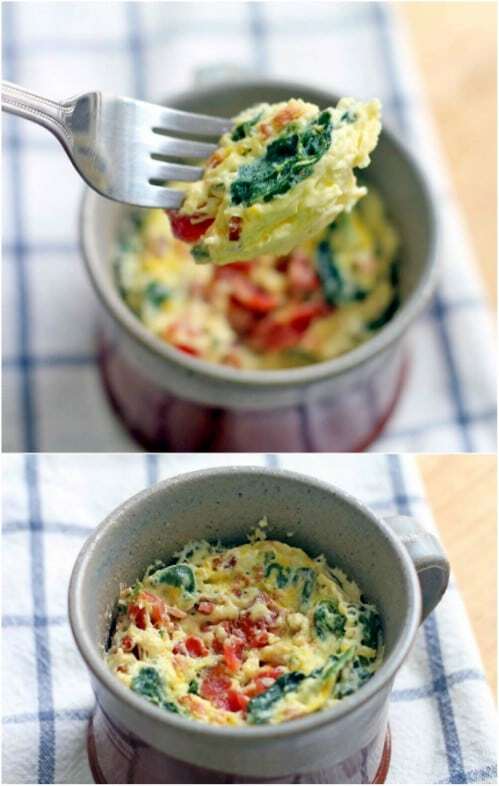 You make it in a mug in the microwave and it has delicious ingredients like red peppers, feta cheese, spinach and green onions. Plus, there are only 187 calories in a serving and just three grams of carbs! This quick and easy breakfast is packed full of protein and will keep you full for hours. If you smother something with avocado, I am game. 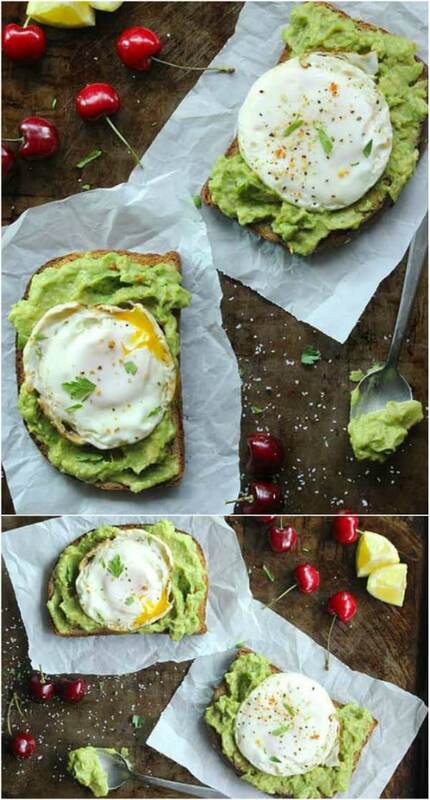 From baked avocado fries to just eating them by the slice, I love the flavor of avocado, which is why I really love this skinny fried egg on avocado toast recipe. It only takes about 10 minutes to make this one and it’s got avocado, which is really healthy. This is a great, filling breakfast idea that you can make in no time – and it goes really well with your morning coffee! This creamy and delicious breakfast pudding only takes a few minute to prepare and it will keep you full until lunch. 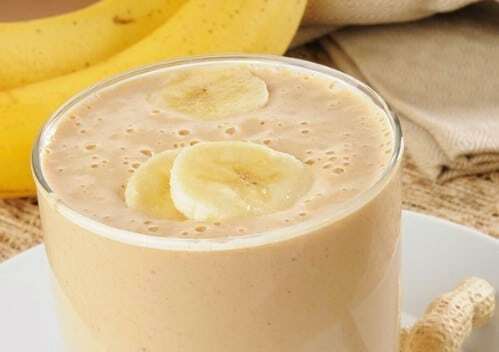 With pureed bananas, low fat milk and peanut butter, it is as healthy as it is tasty. 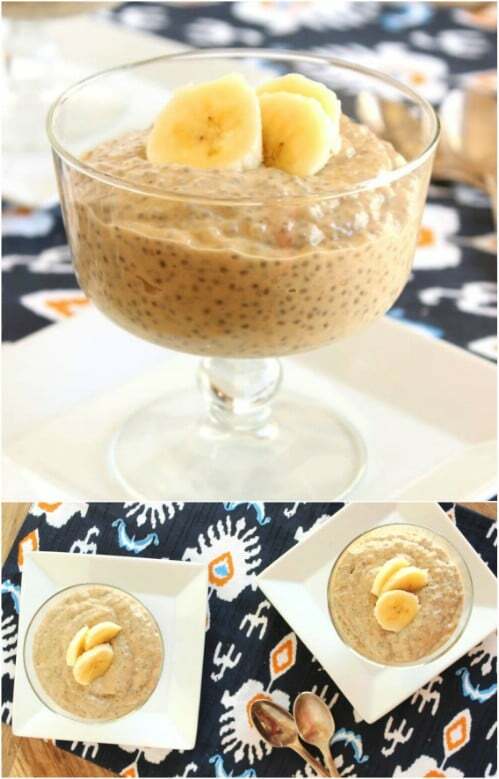 The chia seeds on top just give it extra flavor and extra health benefits. The recipe makes eight servings and each serving has less than 170 calories. What a wonderful way to start the day! 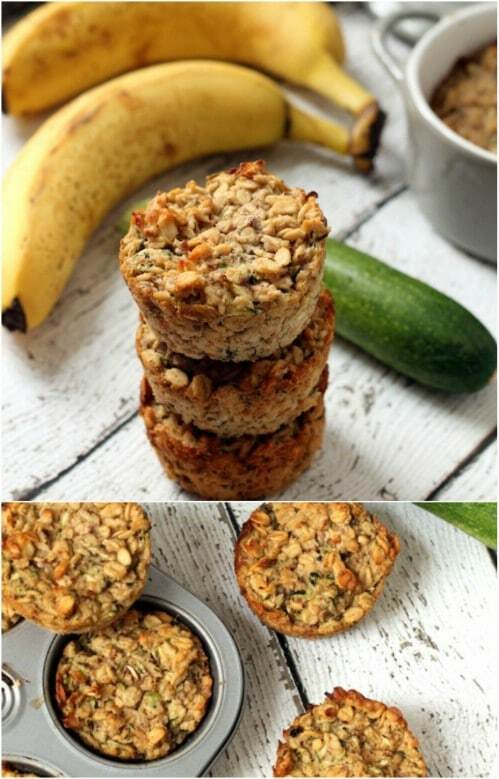 These zucchini and banana oatmeal cups take about half an hour to make but they are definitely worth the extra time. And, you can make them ahead of time and have them on hand for a quick and easy breakfast. These also freeze well so you can make up a couple of batches and always have some on hand. They have so many healthy ingredients like oatmeal, zucchini, bananas, flax seeds, and almond milk. If you only have a few minutes in the morning – and you definitely need a good breakfast – then these oatmeal and blueberry microwave muffins are a must. They are so moist and delicious and only take about two minutes to make! Plus, each muffin has less than 170 calories and only 6 grams of fat. They’re packed with nearly 10 grams of protein, too! Parfait is a great breakfast choice. This particular breakfast parfait has a double dose of yummy veggies. It’s also got a yummy creamy Greek yogurt base and honey and cinnamon, too. 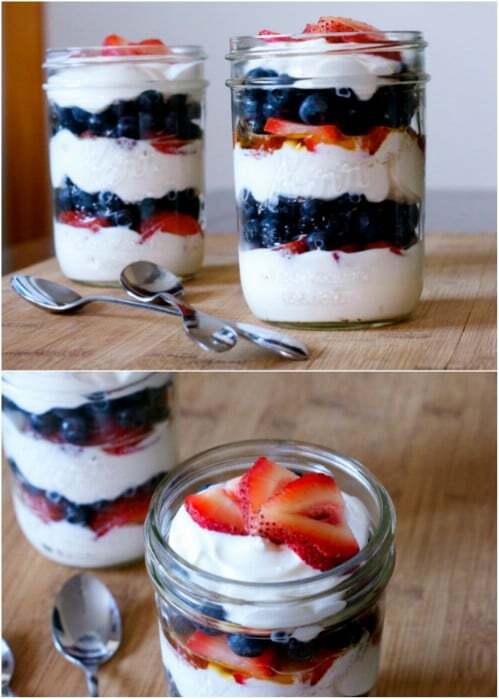 This is a really simple parfait to make and it doubles as a great tasting snack, too. Use whatever berries you want and you can store this one in the fridge in a covered container for up to two days. 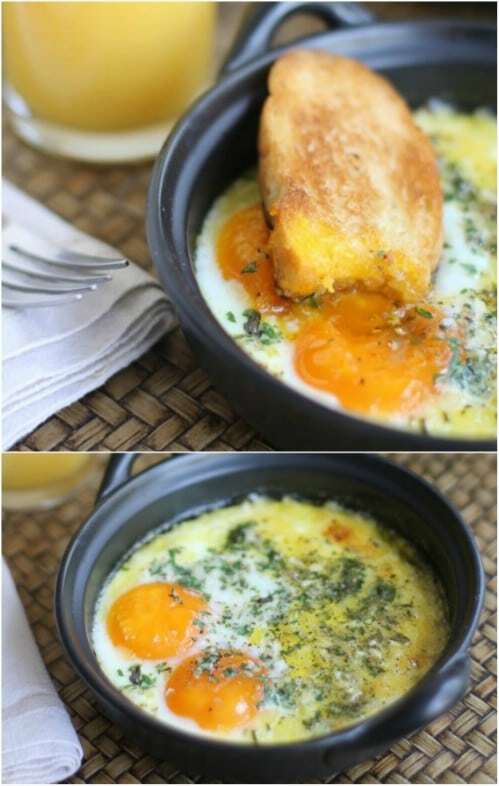 This baked egg dish is delicious and really easy to make. 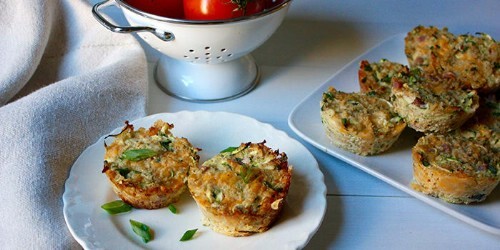 You use ramekin bowls or you could use a muffin tin if that’s all you have on hand. These are made in the oven, so no oils or butter for the cooking and they have low fat mozzarella, eggs and spinach. 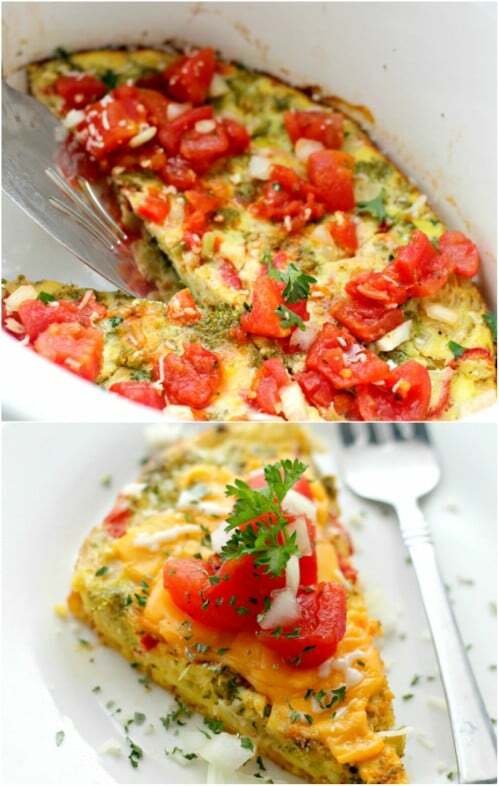 Each egg bake only has about 170 calories and these are really low in fat and have absolutely no carbs. 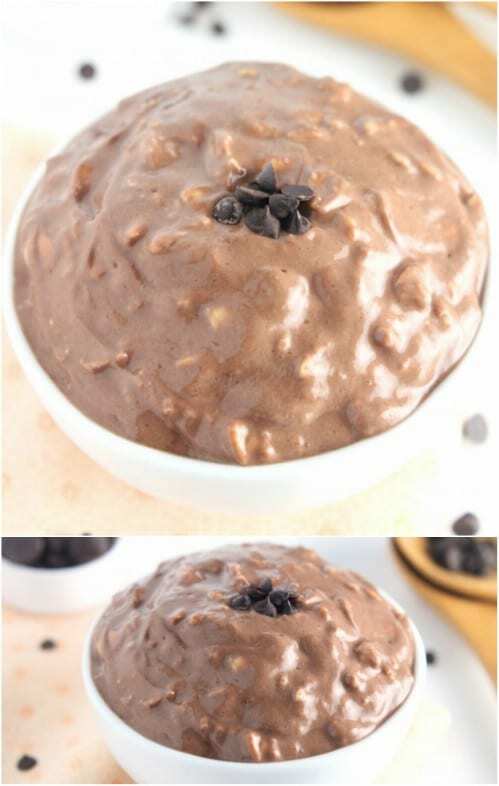 This overnight oatmeal recipe is so very easy to make and it’s delicious. You prepare this one the night before so your breakfast is ready and waiting for you when you awake the next morning. These are gluten free and low in calories and you can store this in the fridge for up to four days in a covered container, so feel free to make a batch for the entire week! It tastes just like a chocolate chip cookie! If smoothies are your think, you are definitely going to want to try this cinnamon roll breakfast smoothie. This thing is full of protein thanks to the added protein powder and it only takes about five or six minutes to make. 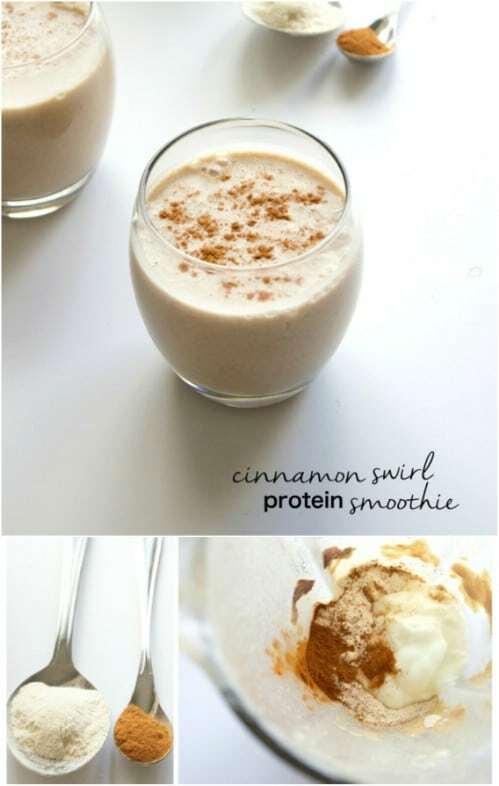 The flavor comes from cinnamon powder, plain yogurt and almond milk. It’s completely gluten free and you can use coconut or almond milk yogurt to make it vegan, too. This crab cakes benedict recipe is really simple to make and it is topped with a delicious fresh avocado relish. The crab cakes have crab meat, yogurt and bread crumbs, along with other ingredients. You top them with an egg and freshly made avocado relish that has avocados, tomatoes, red onion, and a host of fresh herbs and spices. This one has less than 250 calories per serving! Skip the Egg McMuffin from McDonalds, which has nearly 300 calories and is 40 percent carbs, and make this easy breakfast egg muffin instead. This one only has 123 calories per muffin and there is no actual bread involved, so there are no carbs. With eggs, bacon, cheese and chopped spinach, this one is much healthier and tastier than anything you can get at a fast food restaurant. These little quinoa cups are simple to make and you can make them ahead of time so that they’re ready for a grab and go breakfast. They have zucchini, ham and cheese, as well as eggs and a load of herbs and spices. They are as tasty as they are delicious and there are only 155 calories in two of the cups! I always keep granola bars in the pantry for a healthy snack for the kids or a quick grab and go breakfast for myself. 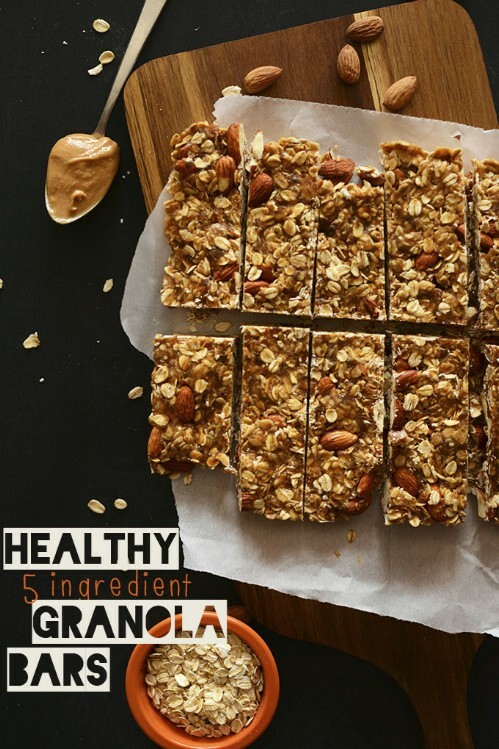 These homemade granola bars are even healthier than those that you buy in the store and there are only five ingredients. You make these with oatmeal, maple syrup or agave nectar, peanut or almond butter, dates and chocolate chips, dried fruit or whatever else you want to add. Each homemade bar has only 217 calories. Baked eggs are a wonderful breakfast choice. Not only are they tasty and filling, when you bake them, they are healthier. These have loads of fresh herbs including parsley, garlic, rosemary and thyme, along with parmesan cheese, eggs and cream. 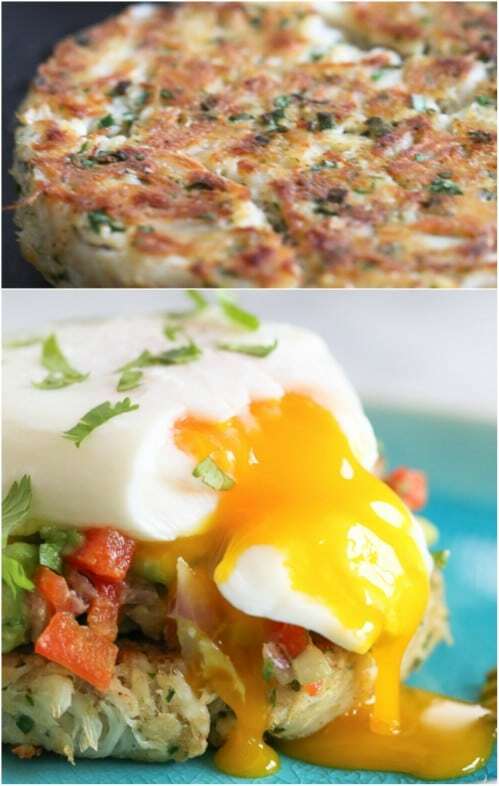 The recipe makes four servings of two eggs each and each serving only has 227 calories. 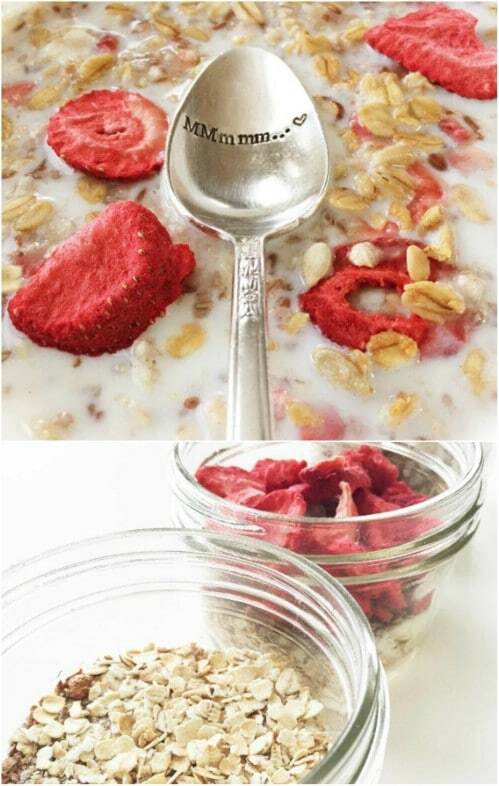 Instant oatmeal is great for a quick breakfast but those packaged oatmeals can have a lot of fat and calories. If you love oatmeal in the morning, consider this homemade instant oatmeal mix, instead. You add everything that you need to just zap this in the microwave for a few seconds and have a steaming bowl of oatmeal. Note that you will need to add the additional calories for any add ins that you want, like chocolate chips, dehydrated fruits, etc. I use the microwave to make eggs all of the time and they turn out delicious every time. You can make this tasty and low calorie breakfast sandwich by microwaving egg whites with spinach leaves. 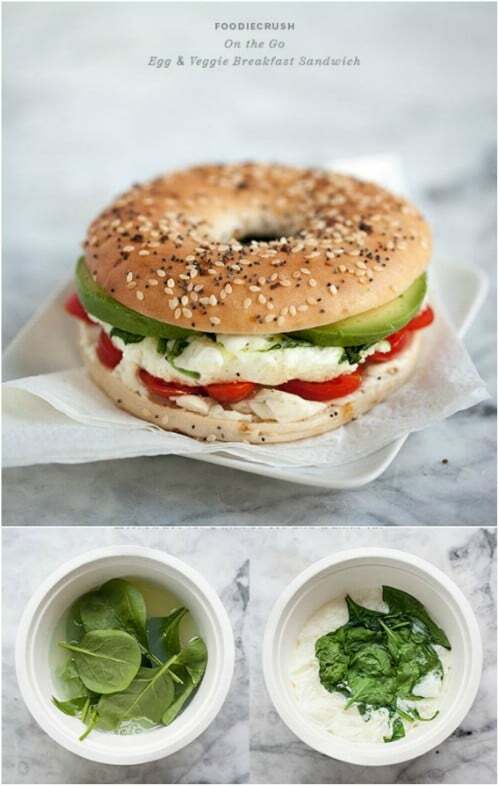 The sandwich also has low fat cheese and avocado and you serve it on a thin “everything” bagel. If you use only the white of the egg, your calorie and fat count will be much lower! This little open faced sandwich is made from whole wheat toast, bananas and sun butter. It’s really simple to make and will only take you a few minutes to put together. 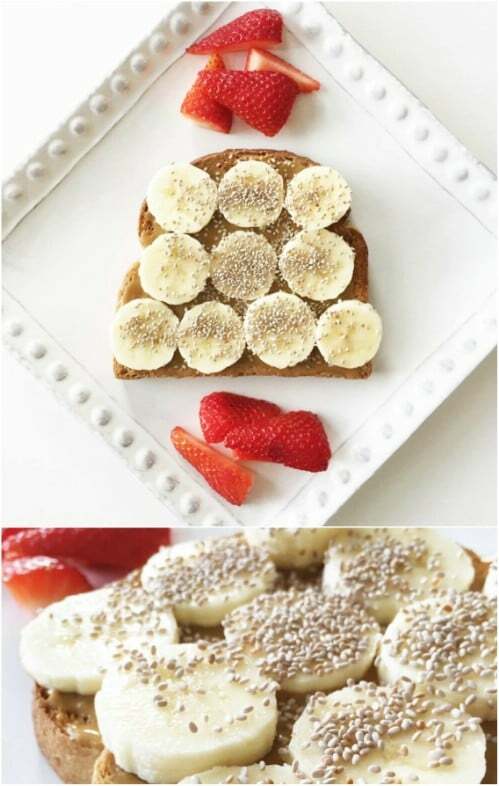 The toast and bananas help you to feel full longer and added chia seeds make it super healthy. This entire sandwich only has 209 calories and nearly nine grams of protein. This is as good as a Nutella stuffed pastry roll but without the fat and calories! 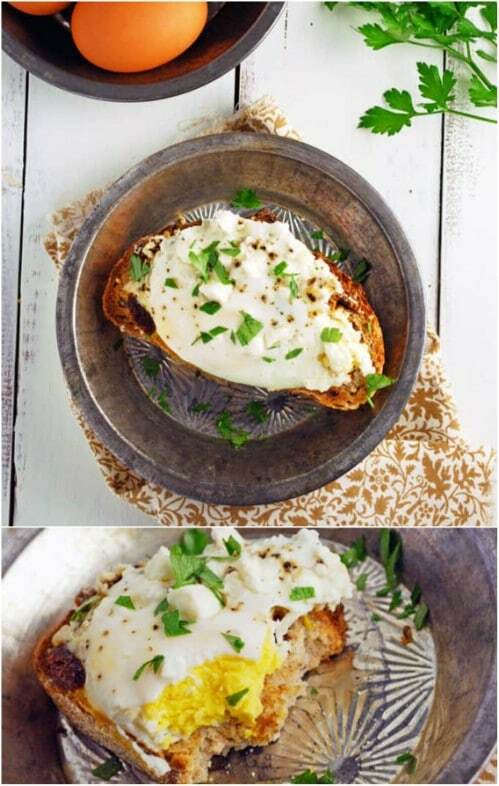 Sundried tomatoes, eggs, feta cheese and herbs give this open faced breakfast sandwich a delicious Mediterranean taste. You will love it – and you will definitely love how low it is in calories. There are only 194 calories in each sandwich, including the toast! It only takes a few minutes to get this one ready to cook and then it cooks on the stovetop for about 15 minutes or so, giving you time to get ready while your breakfast is finishing. This veggie omelet can be made in the slow cooker in just two hours. If you are one of those people who like to get up really early in the morning, you can put this one on while you’re enjoying your first cup of coffee and it’s ready by the time you are. There are only 142 calories in a serving and the recipe makes four servings. You could cook up a batch of this on the weekend and have enough left over for most of the week. I do love easy crock pot recipes. Stuffed peppers for breakfast? Yes, please! I love stuffed peppers and these are even really healthy, so they are definitely a win-win. 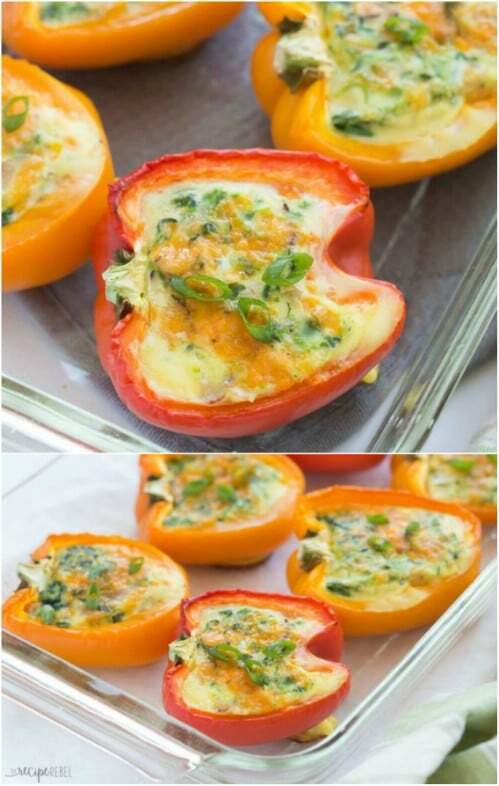 You just stuff your peppers with eggs, green onion, spinach, cheddar cheese and ham and you can cook them in the slow cooker or the oven, whichever you prefer. There are only 164 calories in each one and they are super low in fat! 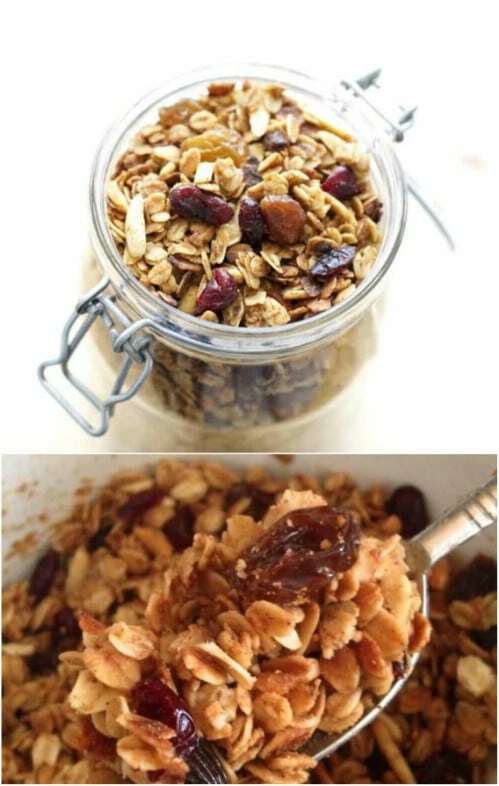 I love good crock pot recipes and this homemade granola is one of my favorites. This would be perfect for those busy mornings when you really don’t have time to stop for breakfast. Just bring a bag of your homemade granola to work with you. This has oatmeal, raisins, almonds, coconut oil, peanut butter and so many other delicious ingredients and it couldn’t be easier to make. Low fat peanut butter and skim milk make this smoothie low in calories. Bananas and sweetener make it delicious. This yummy breakfast smoothie only takes a few minutes to make and it has less than 300 calories per serving. You could do so many different flavors with this, too just by adding in additional fruit or substituting almond butter for peanut butter. 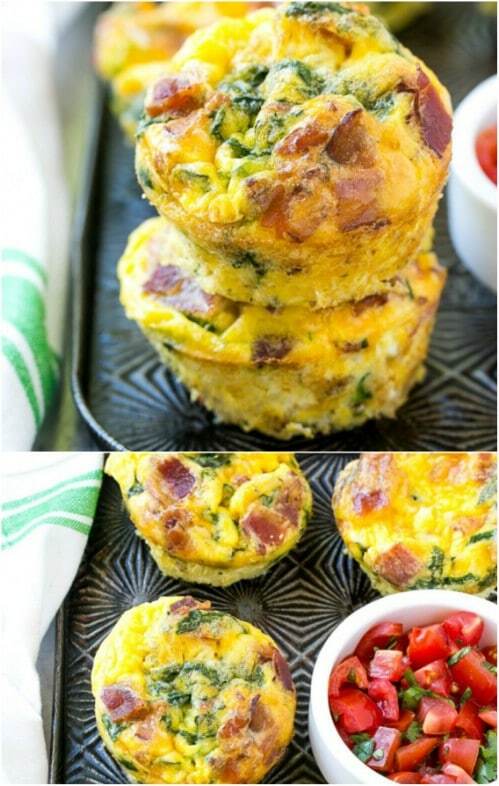 Frittatas are great for breakfast, especially when they are low in calories and filled with protein. These baked vegetable and feta cheese frittatas are super easy to make and the recipe serves two so you can share it or have it two mornings in a row. 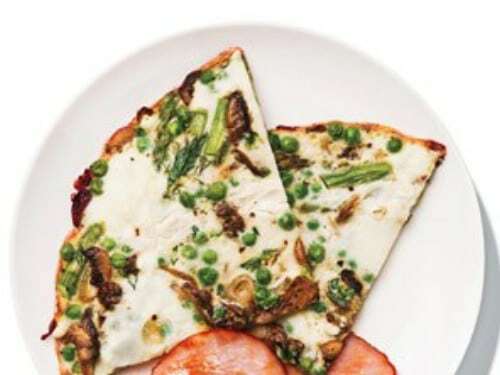 There are only 205 calories per serving and the delicious taste is attributed to the mushrooms, shallots, asparagus and Canadian turkey bacon. You can also make this a low calorie spinach and bacon frittata. You can have a really healthy and filling breakfast, even if you don’t eat eggs. 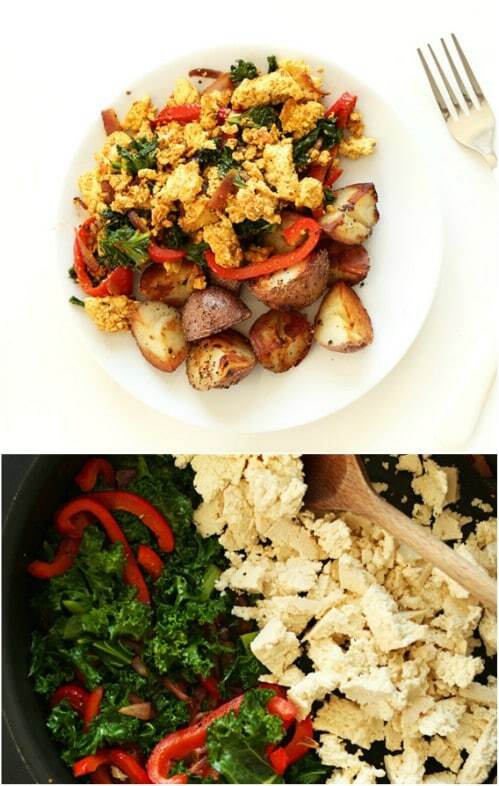 This yummy southwest tofu scramble uses tofu instead of eggs and it has red onion, peppers, kale and a delicious homemade sauce. There are less than 300 calories per serving and the recipe serves two. If you have some extra time in the morning – this one takes about half an hour – you will definitely want to try this tasty and filling breakfast recipe. A salad for breakfast? I love salad anytime of the day and this poached egg white and turkey bacon salad is perfect for first thing in the morning. There are less than 300 calories in a serving and this is a really simple dish to make. It has frisee or endive, which is a really tasty green, as well as turkey bacon, poached egg whites and whole grain mustard – it also has vinegar. This is a dish filled with taste that will keep you full until lunch. Yes, you can make quiche in the microwave! This one has spinach and cheddar cheese and only takes about five minutes to prepare. 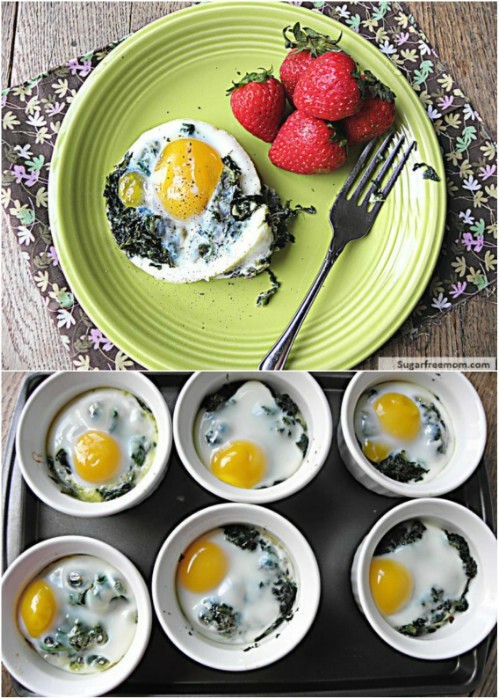 It is so tasty and is filled with protein from the spinach and eggs. It also has a slice of bacon! 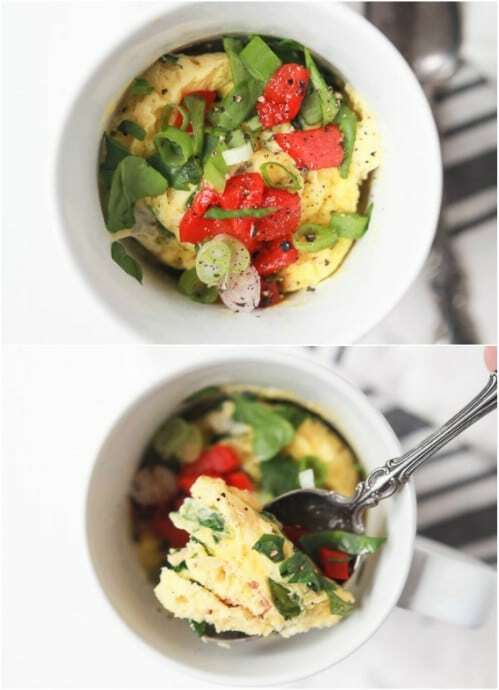 This is a low calorie, low carb delicious veggie start to your day and you can make it in the microwave while you’re getting ready in the morning. Anytime you add avocado to something, I’m game. This breakfast burrito has avocado as well as black beans and sweet potatoes. 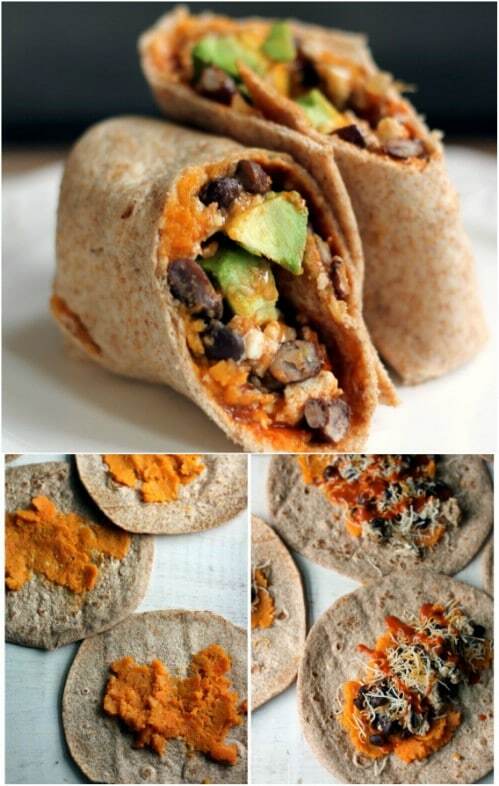 The recipe makes six and there are less than 300 calories in one burrito. This is a great grab and go breakfast and it only takes less than half an hour to make. If you want something flavorful and filling first thing in the morning, this is a great recipe to try. Shakshuka is eggs that are poached in a tasty tomato sauce. 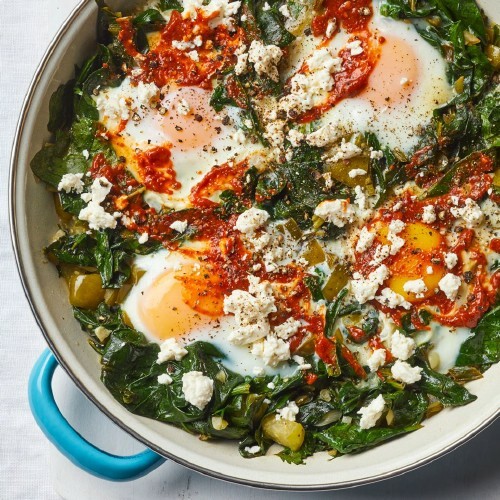 This one pan breakfast includes spinach and a number of herbs, as well as tomatillos. It is a delicious and fairly easy breakfast to make and the recipe serves four. There are only 210 calories in a serving, which is packed with healthy and protein rich vegetables that are sure to keep you feeling full until lunch. Who says you can’t have pancakes for breakfast when watching your calories? 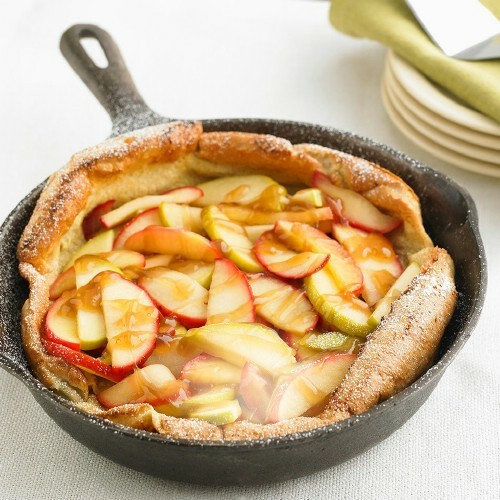 This apple puff oven pancake comes in at just 145 calories and three grams of fat – and that’s with a delicious caramel sauce! This is a super easy one to make and it bakes, so you can go about getting ready for your day while the pancake is baking away. This one also qualifies as a good diabetic breakfast. This is a great recipe to try out those apple slicing hacks. 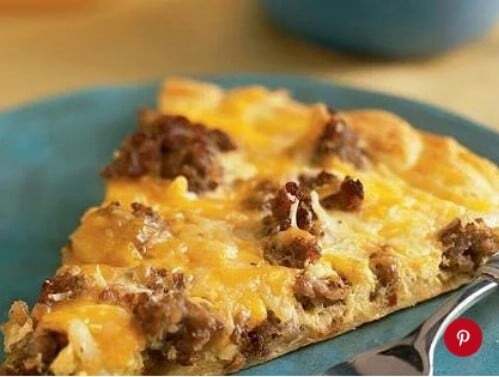 Pizza is great for breakfast anytime and this one is made with breakfast foods like turkey sausage and eggs. If you use turkey or chicken sausage, low fat cheese and shredded potatoes, you can cut the calories from traditional breakfast pizzas. This one only has about 300 calories per serving and the recipe serves eight. It’s also a really simple one to make and only takes about half an hour from start to finish. Thank you for this list! 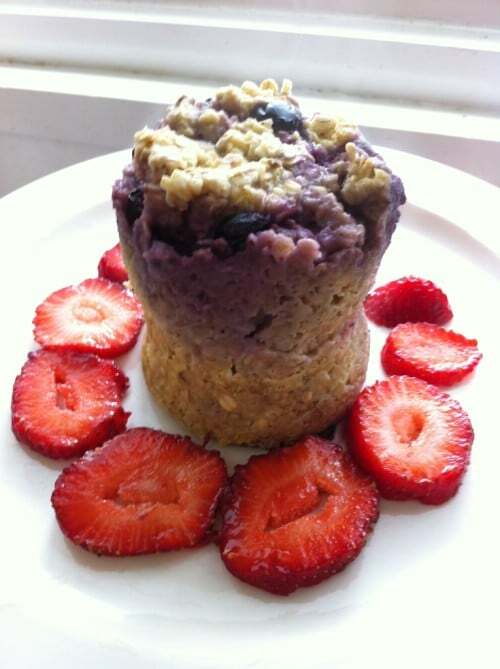 I found many great ideas for making healthy breakfasts! Wow! It’s really amazing. I found many ideas for making a tasty and healthy breakfast. Thanks for the article.